﻿ How to put my logo on the flip book? How to put my logo on the flip book? Q: Hey, I want to make a flipping book with your flip book maker for a very important presentation, but I would like to place my logo to the flip book instead of the default one. Please help me settle this problem. A:It is known that logo is not only a symbol of someone and a group but a kind of ownership. It plays a very important role in our daily working life. For example, when we have a presentation (as customer said) you also would like others know who you are. When we send out document paper to others, also we need others know which company you are. What’s more, the logo can be distinguished yours from others. Now, back to the topic how to place your logo on. Please follow my steps to make it smoothly. 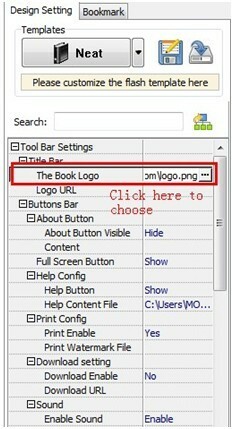 Step1: open the design setting window, select the Title Bar click to choose the logo you need. Step2: if you want to link your logo to your company website, please type your website address in “logo URL” window. Finally, please click button “Apply Change” to save and check your change. And you logo is right there. Warn Tips here: please do remember adjust your logo size into a proper one before you import it into your file.